Oregon Wine Board honors industry professionals for contributions for efforts supporting wine industry. Oregon's wine community was aglow with recognition during an awards luncheon at the Oregon Wine Symposium on Wednesday, Feb. 21. More than 1,300 wine industry professionals were on hand to celebrate the accomplishments of colleagues throughout the state who continue to champion the advancement of Oregon wine. Nine awards were presented, including the first Oregon Wine Leadership award, presented to Sen. Jackie Winters for her tireless support of the statewide wine industry. "With more than 725 wineries in Oregon, there are many leaders among us who quietly move the needle, and the Oregon Wine Board wants to recognize them in continuing to put Oregon wine on the map," said Sally Murdoch, communications manager at the Oregon Wine Board. "The selection process is painstaking, and winners should take pride in their peers seeing their value as emerging leaders." The newly-designated Oregon Wine Leadership Award, awarded in its inaugural year by the Oregon Winegrowers Association to Sen. Jackie Winters, recognizes Winters' lengthy list of accomplishments and record of advocacy for the Oregon wine industry. Despite a tough budget climate, Winters was instrumental in securing $500,000 for the Market Access and Research Investment Strategy (MARIS) project, which supports research initiatives and promotional programs to help Oregon's family-owned wine businesses expand awareness and reach new customers. Winters was also the chief sponsor of the Oregon Wine Country license plate program, the first of its kind nationally, and worked to make sure that proceeds from plate sales went exclusively into wine and culinary tourism programs. Starting in 2010, Winters pushed the industry to come to a consensus on a new policy which led to passage of Senate Bill 841, allowing wineries to pair food and wine to enhance wine appreciation while ensuring responsible alcohol service. Patty Green, late winemaker and founder of award-winning Patricia Green Cellars, posthumously received the Lifetime Achievement Award. 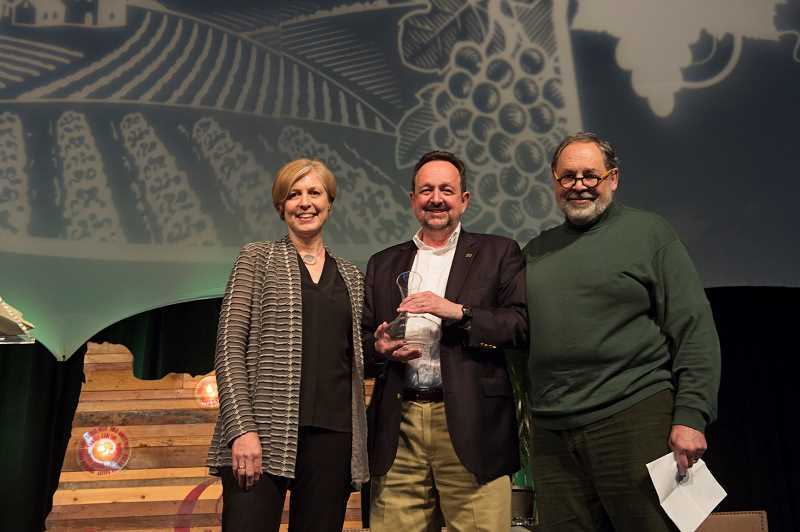 Matt Russell, Patricia Green Cellar Master since 2007, accepted the award on her behalf and pointed to Green nurturing the careers of many emerging winemakers within the Oregon wine industry, guiding under one simple maxim: Do what needs to be done. Green left a legacy with Oregon winemaking; she cut her teeth at Adelsheim Vineyard in Newberg in the early 1990s, then founded Torii Mor. The Founders Award honors people whose sustained efforts have positively affected the direction and accomplishments of Oregon wine. Norm McKibben, former Director of the Oregon Wine Board and founder of Pepper Bridge Winery, presented this award in 2108 to fellow Walla Walla farmer and winemaker Casey McClellan of Seven Hills Winery. McClellan is also a former Oregon Wine Board director who began working in agriculture as a preteen, joining his father in planting the now-famous Seven Hills Vineyard in the early 1980s. In 1988, he and his wife, Vicky, founded Seven Hills Winery. Bob Martin, courtesy faculty in the Oregon State University College of Agricultural Sciences, and supervisory research plant pathologist for USDA- Agricultural Research Service was chosen as the recipient of the Outstanding Industry Leadership Award. Martin has worked with viruses in small fruit crops since 1980 and has been a research leader at the USDA-ARS Horticultural Crops Research Unit since 2004, working with a team of 15 scientists and 70 staff members, while maintaining a research program in virology. Dr. Tom Hellie, president of Linfield College, accepted the Industry Partner Award, which honors those who significantly assist in the growth and success of the industry and its members. Said award co-presenter Ellen Brittan on Hellie's guidance and leadership: "Tom's passion for wine has resulted in a world-class wine studies program at Linfield, the only multidisciplinary liberal arts wine program in the world." The Vineyard Excellence Award has traditionally been presented to a vineyard professional who demonstrates outstanding collaborative support under the supervision of vineyard managers, directors and viticulturists, displaying remarkable technical knowledge, professionalism and outstanding work ethic. Leobardo "Lupe" Gomez of Seven Hills Vineyard accepted the award for 2018. Gomez started with Norm McKibben and Tom Waliser in 1991 planting the first blocks that are now part of Pepper Bridge Vineyard. He has been instrumental in the conversion of hundreds of acres of cherries, apples and wheat fields into some of the world's finest vineyards, and under his training, hundreds of vineyard technicians and vineyard managers have benefitted from his agricultural knowledge. Ganna Fedorova, beverage director of City Winery, came from NYC to accept the Oregon Wine Board's A-List Wine Program of the Year Award. City Winery offers depth and breadth across its Oregon selections, participates in Oregon Wine Month and offers educational opportunities for staff and clientele alike on Oregon wines. City Winery also has a well-curated, diverse selection of producers and both traditional and uncommon varieties of Oregon wines and they make a house wine from Oregon grapes, which help to increase visibility of the state on their house wine list. City Winery has locations in six cities (NYC, Chicago, Nashville, Atlanta, Wash., D.C., Boston), helping expand market reach of Oregon wines. Finally, the Oregon Wine Board Service Awards were presented by OWB Chairman emeritus Steve Thomson of Cristom Wines, and were awarded to Ellen Brittan and Doug Tunnell. Brittan is a Pacific NW native and co-owner of Brittan Vineyards with a long-held passion for food and wine. As the former Director of Wine Education at Linfield College, she combined her industry expertise with a liberal arts approach to wine education. An OWB board member emeritus for six years including 2015 as board chair, Brittan has devoted hundreds of hours to furthering education in wine while moving Oregon wines forward. Similarly, Doug Tunnell has devoted countless hours to wine communication and winemaking knowledge as member emeritus of the Oregon Wine Board for six years. Tunnell served as the Board's Vice-Chair in 2017. A Willamette Valley native and former CBS broadcaster, Tunnell happened upon winemaking on a drive through a dilapidated farm which later became Brick House Wines. He certified the 40 acres as organic, planted 10 of them with Pinot noir grapes, and shortly thereafter adopted the process of Biodynamics®, to foster better all-around health and vitality for his soils and plants. The Oregon Wine Board is a semi-independent Oregon state agency managing marketing, research and education initiatives that support and advance the Oregon wine and wine grape industry.